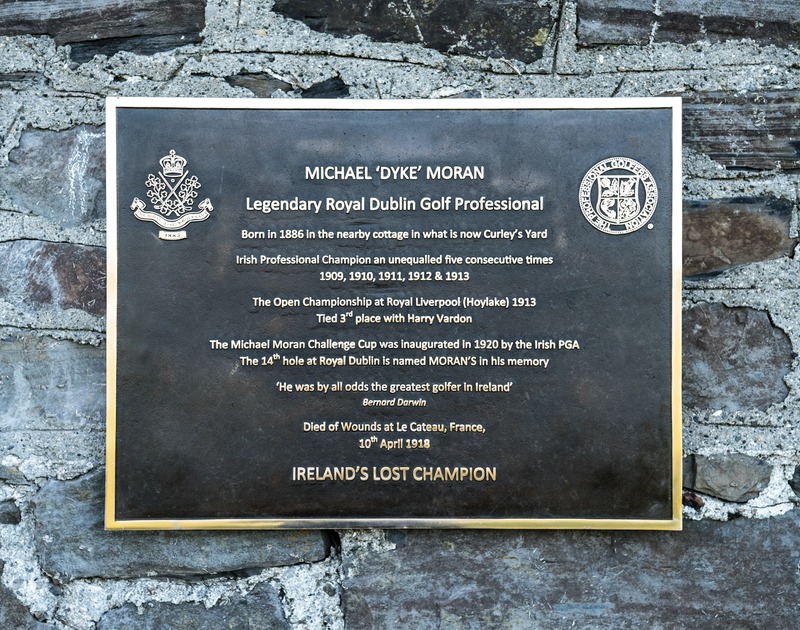 Michael "Dyke" Moran was born in 1886 in a small one-roomed cottage on Bull Island, Dollymount in the demesne of what was to become the Royal Dublin Golf Club. The cottage, located between the 3rd and 13th holes, was in what is now called Curley's Yard after Michael’s grandfather Patrick Curley.He was an assistant to Tom Hood the professional at Royal Dublin, before taking up the job ofprofessional at Dundalk GC in 1907, he then moved to Galway GC in 1908 before returning to RoyalDublin in 1909 as playing professional. A group of Irish professionals convened a meeting in the North Star Hotel in Amiens Street, Dublin in 1907 to form the Irish PGA. Michael 'Dyke' Moran of Royal Dublin was elected its first chairman. He won the Irish Professional Championship for five consecutive years from 1909 to 1913, a feat which has never been equalled. He tied for third place with Harry Vardon in the Open championship in1913 at Hoylake Royal Liverpool. He was the first Irishman to win prize money at the Open. The next was Fred Daly who became the first Irishman to win the British Open in 1947 at the same venue. In 1914 he left Dollymount for Seaham Harbour Golf Club in County Durham never to return as that year Royal Dublin was appropriated by the military for use as a musketry range. He enlisted in the South Irish Horse Regiment in 1915 and later transferred to the Royal Irish Regiment. Michael Moran was 32 years of age when he died of wounds in France on 10th April 1918; 100 years ago and is buried at Le Cateau Military Cemetery in France. The Irish PGA of which he was the first Chairman instituted the Moran Cup in 1920 which of course was a troubled time in Ireland and to me it shows the esteem in which Michael Moran was held by his Professional colleagues. It is one of the oldest professional competitions in Ireland and has been through some ups and downs over the years, but it is still going strong. The 14th hole at Royal Dublin is named Moran’s in his memory and the Moran Room in the clubhouse overlooks the 18th green. The Irish Professional Championship was first played 1907 at Royal Portrush, as an 18-hole stroke play with the leading 8 qualifying for the match play. Local professional James Edmundson defeated Yorkshireman Bertie Snowball 2&1 in the final. There was a 36-hole stroke-play event the previous day, won by Michael Moran with a score of 154, 4 ahead of his nearest rival. The Championship was preceded by the first professional match between Ireland and Scotland, in which Michael Moran (Dundalk) played. Teams of 12 played singles & foursomes. Ireland beat Scotland by 14 matches to 3 with 1 match halved. The first day was a 36-hole event with 8 qualifying for match play. As in 1907 Edmundson and Snowball again met in the 36-hole final. Edmundson won comfortably 5&3 winning a gold medal and the £10 first prize. James Edmundson was joint leader with Michael Moran with scores of 167. Edmundson was finally defeated in the first round. Michael Moran defeated Harry Kidd in the final 9&7 for his first of five successive victories. Defending champion Michael Moran pulled 7 ahead at the end of the first day after a second round 72, a course record. On the second day Moran set another course record of 70, extending his lead to 13. A final round of 76 gave him a 10 stroke win over Michael Cahill and 23 strokes ahead of the rest of the field. Michael Moran led after the first day on 159, three ahead of James Edmundson. After the third round they were on level terms. Moran then scored a final round 72 to Edmundson's 78 to win by six strokes. Hugh McNeill finished third a further three shots behind. Pat Doyle led after the first day on 152, having set a course record of 72 in his afternoon round. Michael Moran was three behind on 155. Moran scored 75 in the third round to Doyle's 82 to take a 4 stroke lead. Another 75 from Moran gave him a 6 shot win over Doyle who finished with a 77. Harry Hamill was third, a further shot behind. 1913 – 72 hole stroke play event Portmarnock After two rounds defending champion Michael Moran was tied for fifth after a second round 88. After a third round 79 O'Hare lead by 5 strokes from McNeill and Charlie Pope with Moran a further shot back. McNeill and Pope faded in the final round, while O'Hare and Moran both took 39 for the front nine. O'Hare came home in 44 to Moran's 36 to give Moran a two stroke victory and his fifth successive title. Pope shot an 82 to finish third. 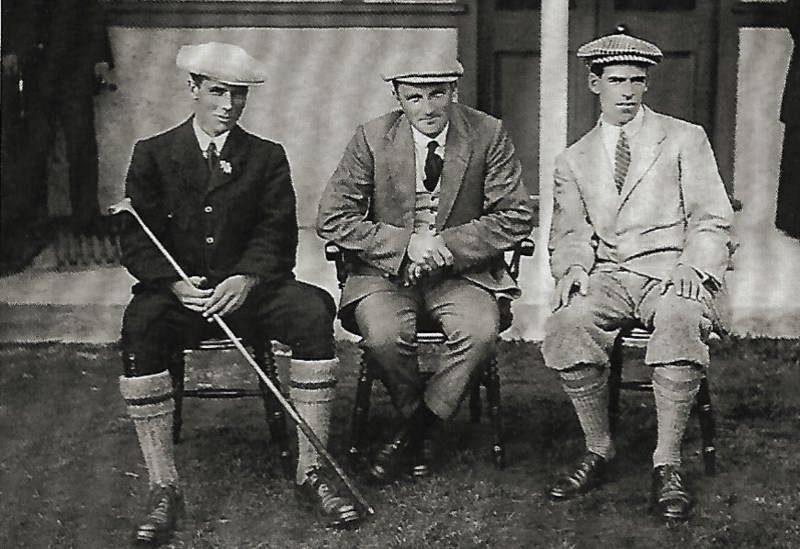 ****In early 1914 Michael Moran left The Royal Dublin Golf Club to be the professional at Seaham Harbour, County Durham and so he was not eligible to defend his title in 1914. On a day with mixed weather 45 professionals and their amateur partners played a Pro-Am in memory of our legendary former professional Michael “Dyke” Moran. Clontarf’s Eamonn Brady won the individual stroke play event with a superb 66 gross, 6 under par, featuring five birdies, an eagle and one bogey. Eamonn finished three strokes clear of Michael McDermott and local assistant Brian McCormack Jnr who finished in joint second place with a 69 gross. With his victory, Eamonn a former Irish International and member of The Royal Dublin Golf Club maintains the Club’s strong links with Dyke Moran and The Moran Cup. 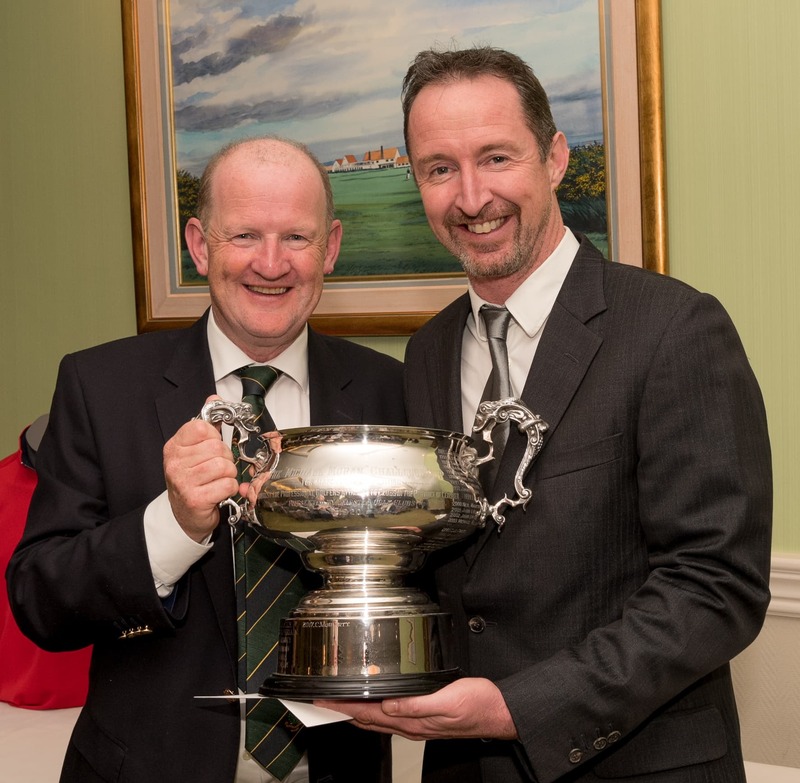 After a number of speeches commending the past exploits of Michael Moran The Royal Dublin Golf Club Captain Mr Brian Purcell presented the winner Eamonn Brady with the Moran Cup, pictured below. 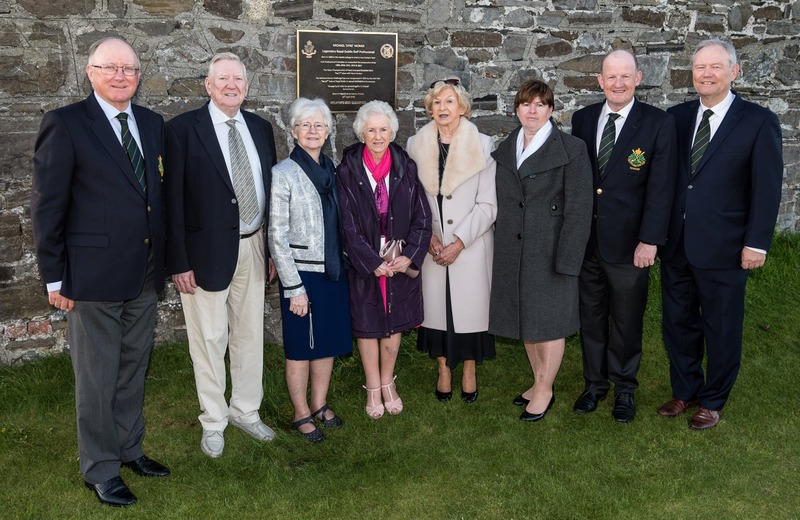 The Royal Dublin Golf Club invited members of Dyke's family to attend the day and the evening alongside the Captains’ of the golf club’s that Moran was associated with. Earlier in the day the Club unveiled a plaque, located at Curley’s Yard, the club’s greenkeepers shed and site of the one room cottage where Dyke was born. It was fitting that his family were there for the unveiling and later in the evening they were presented a beautiful photo of Dyke at the dinner. From left to right; Kieran Howard (President), Thomas Curley, Ann Hickey, Molly Perry, Bernie O’Shaughnessy, Linda Byrne, Brian Purcell (Captain), and Peter Finnegan (Ex. Officio).